Immenseikoff, Immenseikoff Behold in me a Shoreditch Toff A toff, a toff, a toff, a Shoreditch Toff And I think myself Immenseikoff. Left: The cover of the sheet music of Arthur Lloyd's song, showing Lloyd in the typical flash clothing of the swell of the period. 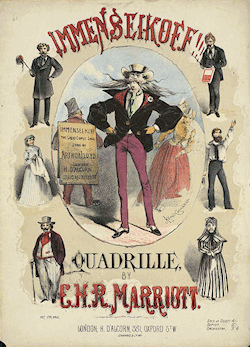 Right: The cover of Charles Marriott's quadrille version. 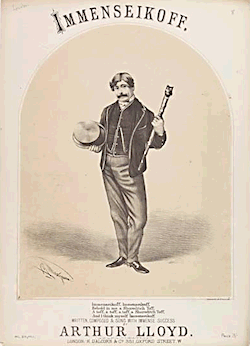 His song became popular (an American visiting London in 1870 remarked that everyone was humming it). His word likewise became well known. In 1869 it appeared in a story in an American newspaper as the name of a Russian giantess in a circus. The same year Charles Marriott, a popular light-music composer of the period, turned Lloyd’s song into a quadrille with the same title. The word soon lost its second e and came to mean an overcoat. Several decades later it was claimed that this came about because Lloyd wore one when performing the song. However, no contemporary reference exists that I can find and his song doesn’t mention an overcoat. On the cover of the sheet music he’s wearing the “flash” fashion of the time. As the covers of his other songs show him in the costumes he wore to perform them, I suspect that he never wore a overcoat while singing Immenseikoff and that the supposed link was added much later in a misguided effort to explain its meaning. The reason for its adopting this meaning is lost to us. The other poach, to illegally hunt fish or game, began life in English to mean prod, shove, or roughly push together, to push or stir. This probably came from the Old French pocher, to prod, and is a relative of another sense of poke. This sense of prodding is obsolete in mainstream English but survives to some extent in regional English dialects and in Scots. Later, poach developed into unlawfully encroaching on someone else’s preserve, to trespass. It has a third sense of breaking up ground into muddy patches through animals trampling it. Last modified: 11 October 2014.